This book is a response to those instructors who feel that calculus textbooks are too big. In writing the book James Stewart asked himself:What is essential for a three-semester calculus course for scientists and engineers? Stewart's ESSENTIAL CALCULUS: EARLY TRANSCENDENTALS offers a concise approach to teaching calculus, focusing on major concepts and supporting those with precise definitions, patient explanations, and carefully graded problems. ESSENTIAL CALCULUS: EARLY TRANSCENDENTALS is only 850 pages-two-thirds the size of Stewart's other calculus texts (CALCULUS, Fifth Edition and CALCULUS, EARLY TRANSCENDENTALS, Fifth Edition)-yet it contains almost all of the same topics. The author achieved this relative brevity mainly by condensing the exposition and by putting some of the features on the website www.StewartCalculus.com. Despite the reduced size of the book, there is still a modern flavor: Conceptual understanding and technology are not neglected, though they are not as prominent as in Stewart's other books. 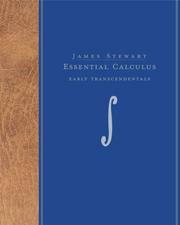 ESSENTIAL CALCULUS: EARLY TRANSCENDENTALS has been written with the same attention to detail, eye for innovation, and meticulous accuracy that have made Stewart's textbooks the best-selling calculus texts in the world. Important Notice: Media content referenced within the product description or the product text may not be available in the ebook version. 9780495014287 PDF is available as a free download.